This is “Muhammad and Islam”, section 8.2 from the book Regional Geography of the World: Globalization, People, and Places (v. 1.0). For details on it (including licensing), click here. Summarize the early life of Muhammad and the origins of Islam. Analyze the differences and similarities among the three main monotheistic religions. Explain the process of spatial diffusion and the various forms it may represent. 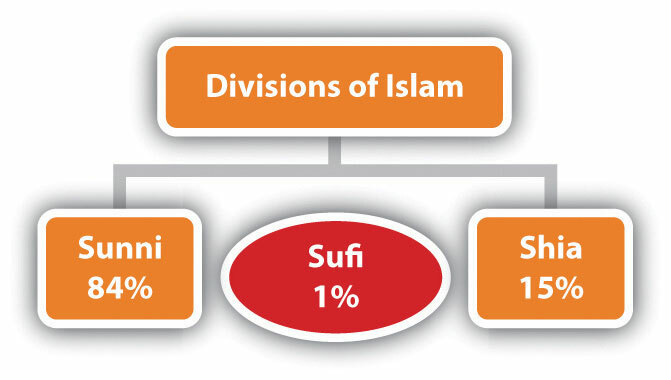 Outline the main divisions of Islam and the approximate percentages of the followers of each division. 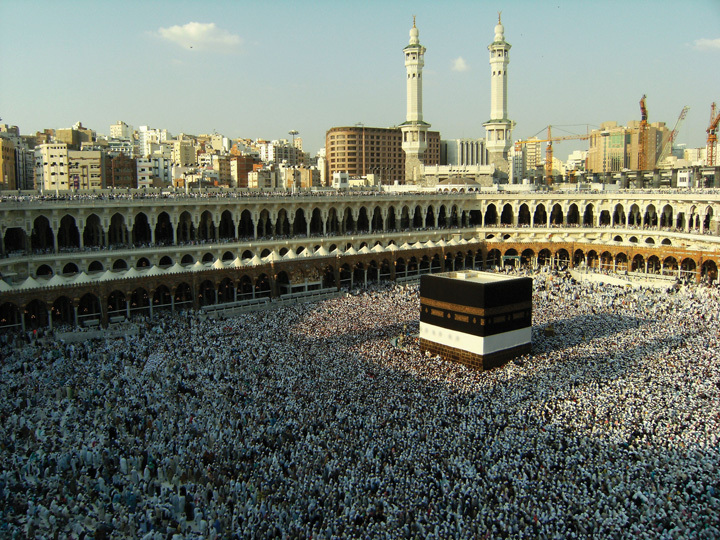 The black rectangular structure in the photo is the Kaaba. Located in the mountains of western Saudi Arabia, the city of Mecca (also spelled Makkah) began as an early trade center for the region and a hub for camel caravans trading throughout Southwest Asia and North Africa. Mecca is about forty-five miles from the Red Sea coast at an elevation of 531 feet. South of Mecca, the mountains reach more than 7,200 feet in elevation. According to Islamic tradition, the patriarch Abraham came to Mecca with his Egyptian wife Hagar and their son Ishmael more than two thousand years before the birth of the Prophet Muhammad (born 571 CE). When Hagar died, Abraham and Ishmael built the Kaaba (or Ka‘ba), a rectangular shrine that included a special stone, in Mecca. The shrine was destined to become one of the holiest sites for nomadic groups in Arabia. Abraham later died in Palestine in what is now the country of Israel. Centuries after Abraham’s death, the Kaaba and the rituals associated with it deteriorated and mixed with other local traditions. The traditional groups in the region of Arabia were polytheistic and worshiped their own gods. By the time of Muhammad, Mecca is said to have been a center of worship to more than 360 deities or gods; the greatest of these was Allah (meaning “the god”). Allah was known as the chief of the Meccan pantheon of gods and was worshiped from southern Syria to Arabia. Mecca was full of idols, temples, and worship sites. Tradition states that the god Allah was the only god without an idol; he would become the sole entity of Muhammad’s new Islamic religion. Muhammad, born in Mecca 571 years after the birth of Christ and about 100 years after the fall of the Roman Empire, was orphaned at an early age, and was employed in a camel caravan when he reached his teens. His life and what has been reported about it changed the Middle East forever. Muhammad traveled throughout the region with the camel caravans. He was fortunate to have been able to live as he did, because most orphans in the region did not have many opportunities in life. His travels introduced him to many people, places, and issues. His situation changed when Muhammad and a widow many years his senior were married. Muhammad became a merchant, the leader of a camel caravan, and a respected member of his community. He was reported to have been intelligent and a wise businessman. The traditional groups that traded in Mecca held many different religious beliefs. The city was a forum for the many vices and activities associated with trade, travel, and metropolitan business. To escape the activities of Mecca, Muhammad would often seek the solitude of the mountains, where he would contemplate and think. Tradition states that the angel Gabriel appeared to him while he was meditating in a mountain cave in 610 CE, when Muhammad was about forty. Muhammad was given words from Allah, which he recited from memory to his followers. According to tradition, Muhammad was illiterate; his supporters wrote down his words, compiled them into the Koran (Qur’an), the holiest book of Islam. Muhammad was the founder of the new religion, which he called Islam (meaning “submission to Allah”). The term Muslim (meaning “one who submits”) refers to a follower of Islam. After Muhammad returned to Mecca and related his visions and Allah’s words from the angel Gabriel, he began to speak out against the city’s vices and many gods. He stated that there was only one god: Allah, the same creator god of Abraham. He spoke out against gambling and drinking alcohol. He advocated the caretaking of widows and orphans. He also preached regarding family and community. His message was not well received: in 622 CE the people of Mecca forced Muhammad out. He fled to the safety of the nearby city of Medina in a journey known as the hejira (hijra)The start of the Islamic calendar, which refers to when Muhammad fled from Mecca to Medina.. This historic journey became the start of the Islamic calendar, which is based on the lunar cycles. Muhammad found refuge in Medina and became a respected citizen. Launching out from Medina, Muhammad and those loyal to him defeated the army of Mecca and converted the city into Islam’s holiest place. They destroyed all Mecca’s idols and temples except the Kaaba. Muhammad’s teaching united the many Arabian groups under one religion. Since the Koran was written in Arabic, Arabic became the official language of Islam. The Kaaba and the mosque built at Mecca became the center of the Islamic world and a destination for Muslim pilgrims. Islam brought a new identity, a faith in one god, and a set of values to the Arab world. Islam made sense in a world with many traditional beliefs and few unifying principles. It’s important to keep in mind that monotheist belief was not new: Christianity had been around for more than six hundred years. Judaism and Zoroastrianism in Persia had been around for centuries before Christianity. The principles of Islam and Muhammad’s teachings are a continuation of Judaism and Christianity. All three traditions assert a faith in a divine creator, with important messages coming through prophets or holy messengers. 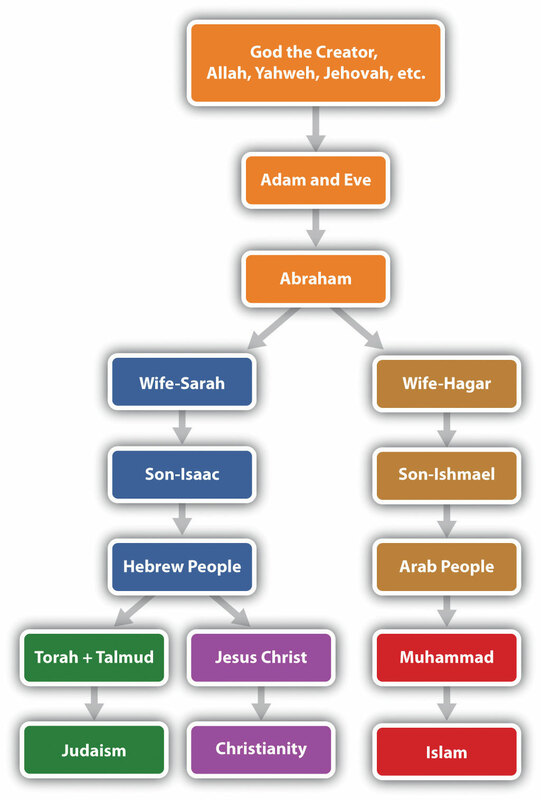 All three religions acknowledge Abraham as a founding patriarch. Muslims believe that Moses and Jesus were major prophets and that Muhammad was the greatest and final prophet. All three religions have stories about creation, Adam and Eve, the flood, and other similar stories that have been adapted to the traditions and characters of each religion. Religion is a part of culture. The religions that emerged out of the Middle East absorbed many of the existing cultural traits, traditions, or habits of the people into their religious practices. Early Islam adapted many Arab cultural traits, styles of dress, foods, and the pilgrimage and folded them into its principles. Early Christianity and Judaism also adopted cultural traits, holidays, styles of dress, and cultural traditions. The spread of Islam was accomplished through trade and conquest. Mecca was a center of trade. When camel caravans left Mecca, they carried Muhammad’s teachings with them. Islam diffused from Mecca and spread throughout the Middle East and into Central Asia and North Africa. The geographic principle of spatial diffusionThe spread of any phenomenon, idea, disease, or concept through a population across space and through time. can be applied to any phenomenon, idea, disease, or concept that spreads through a population across space and through time. The spatial diffusion of Islam outward from Mecca was significant and predictable. There are two main types of spatial diffusion: expansion diffusionA phenomenon that starts at one point and propagates outward from person to person; includes both contagious diffusion and hierarchical diffusion. and relocation diffusionA phenomenon that starts at one point and propagates outward by relocating to a different location.. Expansion diffusion has two main subtypes: contagious diffusion and hierarchical diffusion. A religion can spread from individual to individual through contagious diffusion when a religion starts at one point and propagates or expands outward from person to person or place to place in a pattern similar to the spreading of a disease. Another way a religion can spread through expansion diffusion is hierarchically, when rulers of a region convert to the religion and decree it as the official religion of their realm; the religion filters down the political chain of command and eventually reaches the masses. The second type of diffusion, relocation diffusion, takes place when the religion relocates to a new place from a central point. When Islam jumped from the Middle East to Indonesia, it diffused through relocation. 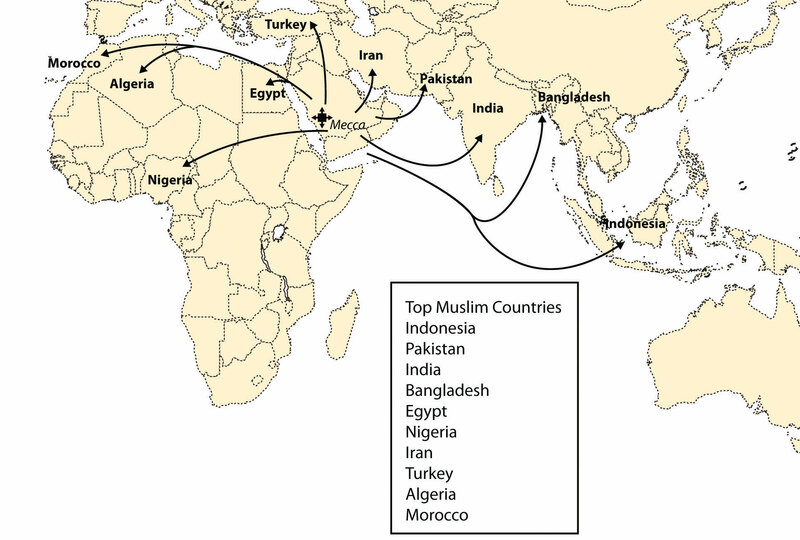 Relocation diffusion also occurred when Islam spread to the United States. Source: Data courtesy of Pew Research Center, Mapping the Global Muslim Population: A Report on the Size and Distribution of the World’s Muslim Population, http://pewforum.org/newassets/images/reports/Muslimpopulation/Muslimpopulation.pdf. Source: Photo courtesy of Antonio Melina of Agência Brasil, http://commons.wikimedia.org/wiki/File:Mosque.jpg. Early on, the unifying principles of Islam found their way into the regional groups of Arabia and into the minds of their leaders. By 700 CE, Islam had spread to the east, to the Mogul Empire of Pakistan and northern India. In India, the Emperor Shah Jehan, who built the famous architectural marvel of the Taj Mahal as a mausoleum for his wife, was a Muslim. The expansion of Islam fueled the Arab Empire of the Middle East. The capital city of the Arab Empire was first established at Medina and then moved to Damascus and later to Baghdad. While Europe was enduring the Dark Ages, Islam was experiencing a renaissance, expanding its knowledge of mathematics, architecture, and the sciences. The Arab institutions of higher learning kept the Greek classics alive and established universities in Toledo (Spain), Cairo, and Baghdad. As of 2010, Islam has attracted as many as 1.5 billion followers, second only to Christianity, which has about 2 billion followers. Hinduism is third, with about 900 million followers. Buddhism is considered the world’s fourth-largest religion. The basic tenets of the Five Pillars of Islam create the foundational structure of Islam. Prayer is an important part of the religion. A Muslim must offer prayers five times a day: before sunrise, at midday, at midafternoon, after sunset, and in the early evening. During prayer, Muslims face toward the compass direction of Mecca. Before clocks and time were well established, a mosque leader would climb a minaret (a tall tower next to the mosque, their place of public worship) and call the faithful to prayer at the required times of day. Muslims gather together for common prayer on Friday, which is a time to unite the community of believers. Mosques sprang up after Muhammad died, and they became the center of community activities in the Islamic world. Express the basic creed (Shahadah). Profess that there is no god but Allah and his messenger and prophet is Muhammad. 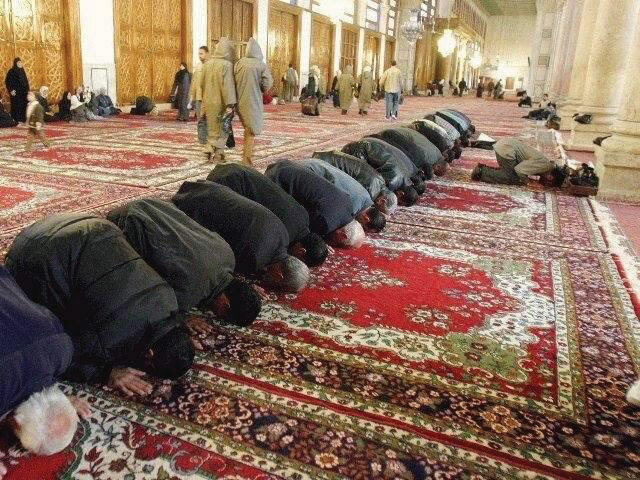 Perform the prayers (Salat). Pray five times a day. Pay alms or give to charity (Zakat). Share what you have with people who are less fortunate. Fast (Sawm). During the month of Ramadan, abstain from personal needs, drinking, and eating from dawn to dusk (as one’s health permits). Make the pilgrimage to Mecca (Hajj). Conduct at least one pilgrimage to the holy city of Mecca (if within one’s capacity). Muhammad died at the age of sixty-two. He never claimed to be a god or anything other than a mere mortal. His tomb is located in Medina, the City of the Prophet. No provision was made to continue Muhammad’s work after he died. One division thought his successor should be a blood relative. This division led to the Shia (or Shi’ite) branch of Islam, which makes up about 15 percent of Muslims. Others felt that the successor should be a worthy follower and did not need to be a blood relative. This branch became known as Sunni, which makes up about 84 percent of Muslims. Various smaller branches of Islam also exist, including Sufi, which approaches the Islamic faith from a more mystical and spiritual perspective. Sunni Muslims look to the family and community for direction; Sunni leaders are elected by the whole community. Shia Muslims look to their imamsMosque leader in Islam. for the official source of direction. Imams hold the religious and political leadership in the Shia faith. Through the right of divine appointment, Imams are considered by many in the Shia division to hold absolute spiritual authority. Imams often have the final word regarding religious doctrine. Shia Muslims consider Muhammad’s son-in-law and cousin Ali to be the origin of the direct line of succession for Imams. Ali is considered in Islam to have been the first person to accept and follow the words of Muhammad. There are many subgroups or branches in each of the Islamic divisions. In understanding the Middle East, it is most critical to understand the Sunni and Shia divisions of Islam. The Shia and Sunni divisions of Islam have sometimes had divergent beliefs, resulting in conflicts. In the early sixteenth century, the Persian Empire, which is now Iran, declared the Shia branch its official religion. Its surrounding neighbors were predominantly Sunni. This divergence is part of the basis for the current civil unrest in Iraq. The two divisions of Islam currently vie for political power and control in Iraq. The majority of the Arab population in Iraq, about 60 percent in 2010, follows the Shia division of Islam, but the leadership under Saddam Hussein until 2003 was Sunni. Tradition states that Ali is buried in the Iraqi city of Najaf, which is considered by Shia Muslims to be one of the holiest sites in Islam. Just north of Najaf is the city of Karbala, which is also considered to be a holy place for Shia Muslims because it is the burial place of the Prophet Muhammad’s grandson Husayn. The Shia majority in Iraq who are Arab share their faith with the Shia majority in Iran who are ethnically Persian. Islam has a code of law called the Sharia criminal code, which is similar to Old Testament law. The Sharia dictates capital punishment for certain crimes. For example, if a person is caught stealing, his or her arm would be severed. For more serious offenses, he or she would be beheaded or stoned to death. Some countries use the Sharia as the law of their country. Countries are called religious statesA state with laws based on religious rules or doctrines determined by religious leaders. (Islamic states in this case) when religious codes take precedence over civil law. States in which people democratically vote on civil law based on common agreement are called secular statesA state with civil law based on democratic consensus or by vote that is not affiliated with any particular religion.. Whereas secular states attempt to separate religious issues and civil law, religious states attempt to combine the two. Iran is a good example of an Islamic religious state, and Turkey is a good example of a secular state. When the United States invaded Iraq in 2003 and Saddam Hussein was removed from leadership, the country entered a transitional period in which they had to decide if the country would develop into an Islamic state with the Sharia or move to a democratically elected government with civil law. The debate on these issues continually surfaces in many of the countries in North Africa and Southwest Asia whenever transition occurs. The cultural forces of democratic reforms and Islamic fundamentalism have been pushing and pulling on the Islamic world. Democratic reformers push for a more open society with equality for women, social freedoms for the people, and democratically elected leaders in government. Islamic fundamentalists pull back toward a stricter following of Islamic teachings; they oppose what they consider the decadent and vulgar ways of Western society and wish to restrict the influence of liberal, nonreligious teaching. A rift between militant Islamic fundamentalists and moderate Islamic reformers is evident throughout the Muslim world. Militant leaders strive to uphold the Sharia criminal code as law. Moderate reformers work toward a civil law based on democratic consensus. This rift adds to the conflicts that have been occurring in this realm. Islamic fundamentalists push for a more traditional and conservative society and express opposition to the United States’ intervention in the realm. The Muslim world will continue to confront such arguments over the future direction of Islam in a globalized economy. Islam has its origins with Muhammad, who was born 571 years after the birth of Jesus, when Christianity was well established. Muhammad received his revelations through the angel Gabriel and passed them to his followers, who wrote down his words into what became the Koran. Islam is the youngest of the three major monotheistic religions of the realm: Judaism, Christianity, and Islam. All three trace their origins back to the patriarch Abraham. Other monotheistic religions, such as the Baha’i faith and Zoroastrianism, are also evident in the Southwest Asia. Spatial diffusion can be applied to any phenomenon, idea, disease, or concept that spreads through a population across space and through time. Islam has diffused through both expansion diffusion and relocation diffusion to become the second most followed religion in the world. Since the death of Muhammad, Islam has divided into a number of different factions. The two most prevalent divisions of Islam are Sunni (followed by about 84 percent of Muslims) and Shia (followed by about 15 percent of Muslims). Other minor divisions of Islam, such as Sufi, also exist. Religious states are structured around laws based on religious regulations that are usually determined by religious leaders. Secular states are structured around civil law, which is decided on by democratic consensus. What was Muhammad’s early life like? Do you think his background influenced his teachings? Who were Sarah and Hagar? How were their sons influential to the people of the Middle East? Name the individual who is considered a patriarch to the three major monotheistic religions of the Middle East. What event triggered the start of the Islamic calendar? What is this calendar based on? List the Five Pillars of Islam. On which day of the week does the Islamic community gather for prayer? Name the two main divisions of Islam. What percentage of Islam’s disciples follow each of the divisions? What are the differences between the two main divisions of Islam? What are the two main types of spatial diffusion? Provide an example of each. What is the difference between a religious state and a secular state? Which of these types of state does the United States fit into? How has the conflict between Islamic fundamentalists and Islamic reformers manifested itself in the North Africa, Southwest Asia, and Turkestan realm in recent years? On a map of this realm, indicate the type of government for each country. Determine which countries are religious states and which are secular states.